Each morning you may help yourself to fresh, homemade breakfast breads from the unique bun-warmer built into our 1880s ornate radiator. A delicious full breakfast is also prepared for you to enjoy either privately in the comfort of your room, or family style in the dining room of our Bozeman accommodations. Breakfast always starts with an artfully arranged combination of fresh fruit and berries garnished with beautiful and tasty edible flowers from the garden (in season) and accompanied with something freshly baked, such as muffins, scones or the Voss Inn’s special cinnamon rolls (as pictured and described in Gourmet magazine.) For the main course, choose between our freshly made granola, hot cereal, or our delectable egg dish, which varies daily and is served in individual ramekins. Coffee drinkers can savor our Bozeman inn’s special blend of organic, fair-trade coffee, which is roasted specifically to our specifications by Grounds for Change. And tea drinkers--prepare yourselves for a treat! It's not often that you will have the opportunity to select from a Tea Master's private collection of rare artisan handcrafted whole leaf teas! In a large bowl mix together the first six ingredients (flour through nutmeg.) Add the coconut, raisins, shredded apples and carrots and the chopped toasted pecans. In another bowl stir together the beaten eggs, oil, vanilla and orange rind and add this mixture to the previously combined ingredients. Stir only until just blended. Do not over-mix. (There should still be some flecks of flour.) Refrigerate the batter overnight or up to one week, or freeze for future use. Generously spray muffin tins with Pam. Fill muffin cups completely. Bake muffins for approximately 25 minutes, or until a tester inserted in center comes out clean. Remove the muffins from the tins immediately and let them cool on a wire rack for a few minutes. Preheat the oven to 400 degrees. Generously spray muffin tins with Pam. Pare the apples and cut each piece into 8 wedges. Slice each wedge crosswise into thin slices. Combine 2 tablespoons of the sugar with the cinnamon and toss the apples with this mixture and set aside. Combine the flour, sugar, baking powder and salt and stir with a wire whisk until well- blended. Add the melted butter to the next three ingredients (eggs through sour cream) and mix well. Pour this mixture into the dry ingredients along with the apples and mix until just combined. (The batter will seem very dry. Be careful not to over-mix, as this will cause the batter to overflow. As soon as you start to think that you should just stir a couple times more - DON'T) Divide the batter evenly between 10 muffin cups. Sprinkle the sliced almonds on top. Bake the muffins in the center of the oven for approximately 20 to 25 minutes. While the muffins are baking, combine the apple jelly and water and slowly bring to a boil, stirring occasionally. Keep this mixture warm until ready to use. When you remove the muffins from the oven, place them on a wire rack for five minutes before removing them gently from the pan. 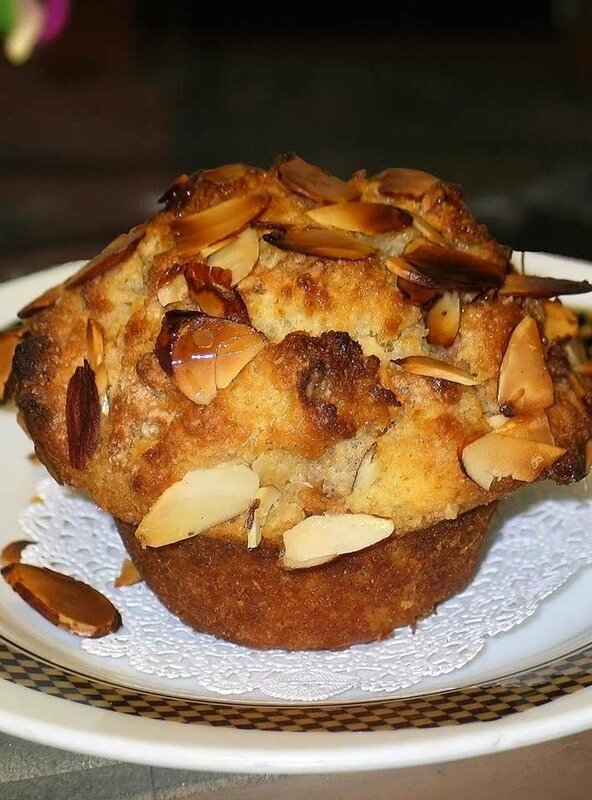 Brush the muffins with the melted apple jelly and serve them warm or cold. 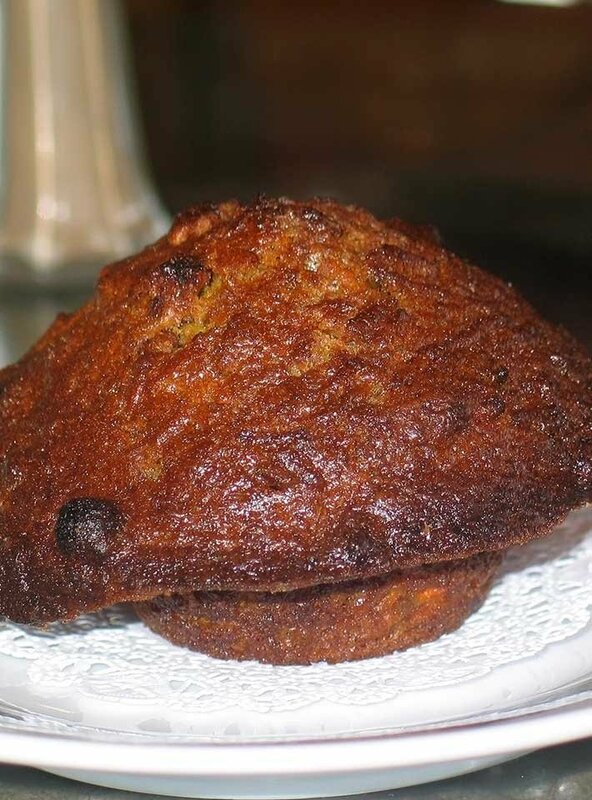 These muffins freeze well after baking. Reheat them before serving.